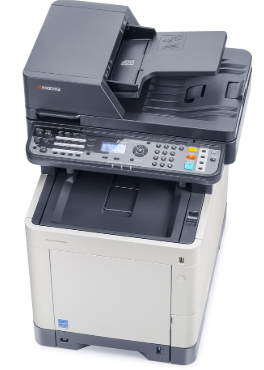 Kyocera ECOSYS M6530CDN is a multifunction (Print, scan and copy) color copy machine with paper size up to folio. The Kyocera ECOSYS M6530CDN engine has speeds of up to 30 sheets per minute. Safety standards: TÜV / GS, CE - This product is manufactured according to ISO 9001 quality standards and ISO 14001 environmental standards. Input capacity: 100-sheet multi-purpose tray; 60 - 220 g / m²; A4, A5, A6, B5, B6, Letter, Legal, Custom (70 x 148 mm - 216 x 356 mm) 250-sheet universal cassette; 60 - 163 g / m²; A4, A5, A6, B5, B6, Letter, Legal, Custom (105 x 148 - 216 x 356 mm). General paper handling: All paper capacities quoted are based on a paper thickness of max. 0.11 mm. Paper use is recommended by KYOCERA under normal environmental conditions. Warranty: 1-year warranty as standard (depending on the country). KYOCERA guarantees the drum and developer for 3 years or 200,000 pages (whichever occurs sooner), provided each device is used and cleaned in accordance with the service instructions. Kyocera ECOSYS M6530cdn. This device is ready to be a key player in your office. This product will help increase productivity in each work group.